Whether you’re toasting the New Year with just your loved one, or bundling up the whole family for a night of fireworks and tasty treats, we have your guide to New Year’s Eve at North Lake Tahoe right here! Ring in the New Year at Northstar’s infamous Fire and Ice Celebration! A DJ kicks off the evening on stage at 1pm, followed by the “Ripperroo Parade” at 4:45pm, where the young ones can blow noisemakers and hang out with Ripperroo. Adults can enjoy “An Evening with Led Zeppelin 2: The Experience” from 7 to 9 pm and the fireworks spectacular at 9 pm! Enjoy Cabana Bar drink specials all evening, from the “Resolution Martini” to the “Chocolate Mistletoe”. Click here for details. 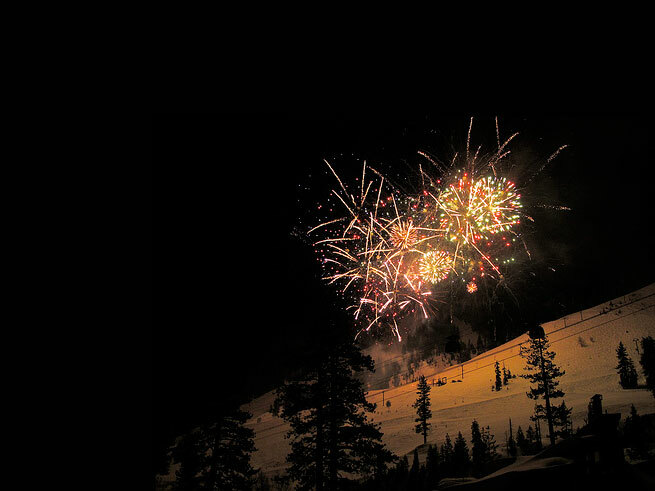 Celebrate New Year’s Eve at High Camp with a all-ages evening on your favorite mountain, Squaw Valley. Ride the Cable Car up to High Camp for a night of entertainment that begins at 6 pm. (Be sure to catch the 5, 5:15, 5:30 or 5:45 pm tram.) You’ll be treated to a fabulous buffet dinner, music and dancing for the young and old alike. No need to stay up to the wee hours because you’ll ring in the New Year with a 9 pm. East Coast New Year’s champagne toast (sparkling apple cider for the youngsters). Afterwards, ride back to the Village to view the New Year’s Eve Fireworks display at 9:30 pm. Reservations are required. Email abarker@squaw.com to reserve your spot. Tickets are $36 adults, $26 kids 12 and under (Cable Car tickets sold separately). If you’re without the kiddos, and looking to celebrate in style then join the New Year’s Eve bash at Squaw Valley’s Olympic House. Known as the biggest party on the North Shore, Olympic House will host two DJ’s and a live band that spreads across all five bars in the lodge. The party starts at 9 pm and goes till drink service ends at 1:30 am. Cover is $10 at the door (cash only) and you must be 21+ with a valid ID. If you still want to see fireworks, a display is scheduled to launch from the Village at 9:30 pm (PT). Before the evening festivities get underway, head over to Squaw Valley Sport at 4pm for wine tasting and shopping! Uncorked Tahoe City hosts a winemaker’s tasting from 4 to 7 p.m with Auteur. Call (530) 581-1106 for details. A unique and glowing way to ring in the New Year! This celebration is for intermediate skiers and riders ages 10 or older who can ski or ride unassisted in the dark on our Race Course run. Tahoe Donner Downhill recommends you come early to ensure you secure a spot in the parade. A DJ and snacks will be provided in the bar area prior to the parade. Sign-up is 4:30-5:45 pm with a 6:00 pm start time. View some video from the 2010 New Year’s parade! Lone Eagle Grille at the Hyatt Regency: Why not dine lakeside with live music at this New Year’s Eve Celebration from 5:30 pm to 12:30 am? Regular menu offered from 5:30 to 7 pm, and a special five-course menu from 8 to 10:30 pm. Call for reservations (775) 886-6899. PlumpJack Cafe at The PlumpJake Inn: PlumpJack hosts a prix-fix New Year’s Eve Dinner with a four-course menu. $120/person. Call for reservations (530) 583-1578. Follow your evening of delectable cuisine by viewing the fireworks spectacular at the Village at 9:30 pm. 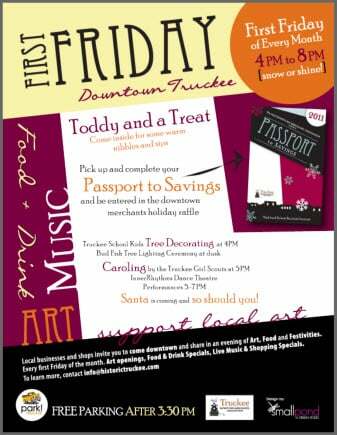 Holiday Events in Truckee: First Fridays! In many cities you may find First Thursdays to whet the curatorial interest of gallery lovers, where visitors enjoy open houses and peruse the work of their favorite artists. You don’t need an urban lifestyle to enjoy art, food and festivities! For the First Friday of each month, participating Downtown Truckee shops and restaurants will offer complimentary art, food, drinks, music and more from 5PM-8PM! Participating stores will display First Friday Flags, so you know where to find the fun! On the First Friday of December (12/2) enjoy Toddy Treat night! The downtown merchants have partnered with Truckee Rotary in their annual lighting of the “Bud Fish” tree. Just after dusk, the tree will be lit for the holiday season and Historic Downtown Truckee will come alive! Gather with the local community and enjoy hot chocolate, treats, kids activities, caroling, dancing and annual tree decorating by elementary school kids, followed by a visit from Santa Claus!